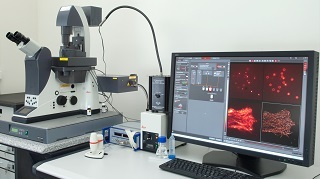 The Center for Microscopy and Image Analysis at University of Zurich provides simple and uncomplicated access to modern technologies. We spoke with Dr. Urs Ziegler, Head of Facility, about the Center’s comprehensive services. ZNZ News: What is your elevator pitch for the Center for Microscopy and Image Analysis? Urs Ziegler: The Center provides access to cutting-edge microscopy techniques for all scientists. Available advanced microscopes cover the whole spectrum from light to electron microscopy, including sample preparation needed for state-of-the-art life science research. Our well-qualified technical and scientific staff teach new users on the use of specific techniques for a required project. Scientists have full access to paramount technology in a flexible, fast and economic way. What is the Center’s special expertise? Cryo-techniques in electron microscopy are the most special expertise we provide. These not only comprise cryo-techniques for structural biology to elucidate the structure of large proteins or protein complexes, but also techniques for the detection of fluorescently labeled molecules in combination with electron microscopy. These correlative techniques are especially well suited for neurobiology, due to the high resolution needed to determine protein expression in intracellular organelles, synapses or in general in the complex morphology of neuronal tissue. In addition, the 3D organization of this tissue is analyzed by electron microscopy in fully automatic ways. How many projects are currently ongoing? There are more than 300 new projects registered each year at the Center. Most of them are projects from new scientists requiring access to technology. In those, the Center is involved in technical and scientific training to use the microscopes. In addition, among others, the Center has established extensive collaborations with research group regarding image processing, clearing and imaging of whole organs and imaging using light and electron microscopy to study structure – function relationships. Can you highlight a successful collaboration? We developed a correlative light and electron microscopy technique suitable for resolving antigens with a resolution down to 20 nm using light microscopy and combining the structural, contextual information acquired by electron microscopy. With this technique we were able to overcome severe drawbacks of existing methods, regarding labeling multiple antigens simultaneously as well as imaging large areas typically needed for neuroscience. This was successfully applied in a collaboration with the research group of Ruxandra Bachmann (Institute of Molecular Life Sciences, MLS). The method is now also employed in the research of Csaba Földy, Brain Research Institute to visualize cell types in different brain regions. Who evaluates which projects are supported? This depends on the scale of the project. Whereas projects requiring user-based access to technologies are always supported, projects requiring intensive collaboration are evaluated by senior scientists at the Center. Long-term projects and collaborations (months to years) are discussed with the steering board of the Center.